Want to see giant seastacks, colorful starfish, smooth pebbles, and watch the sun set into the ocean? Well, then Ruby Beach is for you. Ruby Beach is located 27 miles south of the remote town of Forks on the Pacific Ocean. This beach is often less visited than its sister Kalaloch Beach, but many agree that it is just as beautiful. Ruby Beach is located on the Pacific Ocean in the southwest region of the Olympic Peninsula, south of the town of Forks. Enjoy some of the most scenic tidepools and seastacks in Washington. Visitors are required to purchase a $15.00 Olympic National Park Entrance Pass before arrival. What can I see and do at Ruby Beach? Tide Pools: Check your tide table, because you won’t want to miss the fascinating tide pools at Ruby Beach. The tide pools at Ruby Beach feature bright starfish, giant anemones, and shellfish. The best chances of enjoying tide pools at Ruby Beach are in the mornings of the low tides. Seastacks and Rock Formations: Created by centuries of crashing waves, the Seastacks and rock formations on Ruby Beach will take your breath away. Many of the seastacks are home of plants and wildlife making them small ecosystems. The sight of massive waves crashing into these seastacks is a transcendental experience. Kayaking: Ruby Beach is a sea-kayaking hot spot. On mellow days kayakers can explore the seastacks and rock formations of the region. Kayakers should wear their wetsuits here year round, as waters are chilly even during the summer. Where is Ruby Beach, WA? Rudy Beach is located in the Southern Olympic Peninsula, along the Pacific Ocean. To reach Ruby Beach follow the Olympic Highway, WA-101 27 miles south of the town of Forks, WA. Turn right at the sign for Ruby Beach. When is Ruby Beach, Washington open? Ruby Beach is open year round between sunrise and sunset. Camping on the beach is not permitted. How much does visiting Ruby Beach cost? 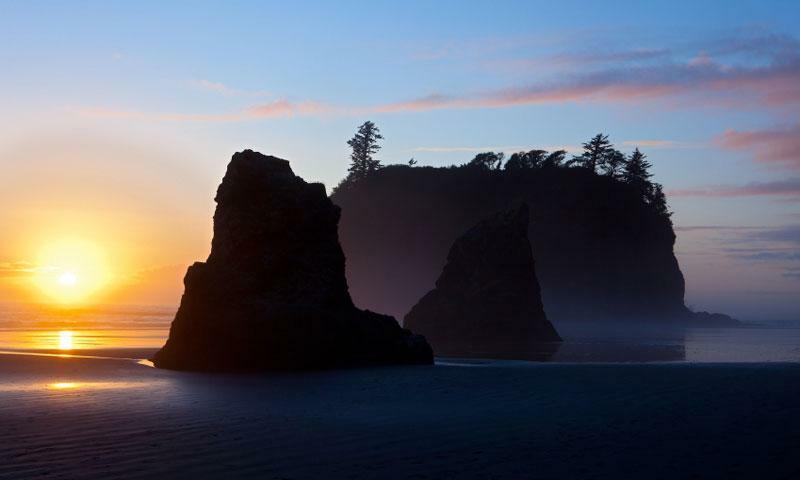 Visitors should purchase an Olympic National Park entrance pass before visiting Ruby Beach.